The One Dance singer hit headlines on Sunday night (28Aug16) when he confessed while presenting Rihanna with the Michael Jackson Video Vanguard Award that he had been "in love" with her since he was 22 years old. The pair furthered speculation of a rekindled relationship in the subsequent days by reportedly kissing and cuddling at a nightclub and then locking lips onstage in Miami, Florida. Rihanna has continued to fuel the rumours on Instagram by writing a lengthy post thanking her team for helping her perform four times at the music ceremony, concluding by declaring her love for Drake and his speech. "Thank you to the beautiful @iamnaomicampbell @therealmaryjblige @traceeellisross for your kind words!" she wrote to her presenters at the end of her post. "@champagnepapi (Drake) your speech was so touching and I love you for that!.. All in all....Best night ever!!! I'm a lucky girl!!! To God be the Glory! #RiRiVanguard"
In the rest of her post, Rihanna thanked all the people that helped her pull off the performances with four different looks and set designs. "It was a challenge but I wanted nothing more than to give my fans a true representation of all the colours that I'm made of as an artist!" she wrote. "Forever grateful to everyone involved creatively, from choreography all the way to wardrobe and production! @MTV team you were a dream to work with!" 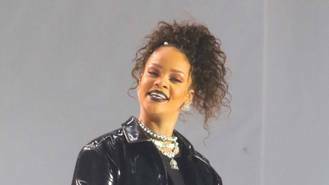 Rihanna and Drake briefly dated in 2010 but have been dodging romance rumours ever since they teamed up for her track Work and performed a raunchy dance routine onstage on several occasions. They have been spending an increasing amount of time together with Rihanna even getting a tattoo of a shark on a left ankle - reportedly a nod to the stuffed animal Drake bought her during a romantic date at an aquarium in Canada in August (16).